Cannot be used as an Xyz Material for an Xyz Summon, except for the Xyz Summon of an Insect-Type monster. 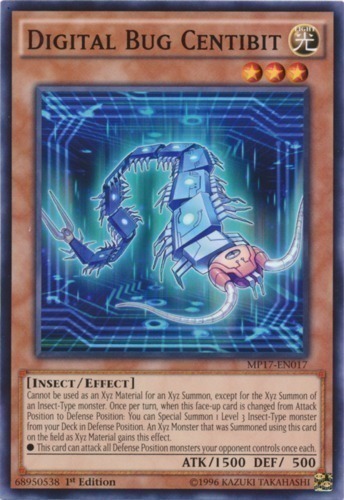 Once per turn, when this face-up card is changed from Attack Position to Defense Position: You can Special Summon 1 Level 3 Insect-Type monster from your Deck in Defense Position. An Xyz Monster that was Summoned using this card on the field as Xyz Material gains this effect. ● This card can attack all Defense Position monsters your opponent controls once each.